It’s been raining here in the Netherlands for a second day in a row with forecast for 17 degrees Celsius. 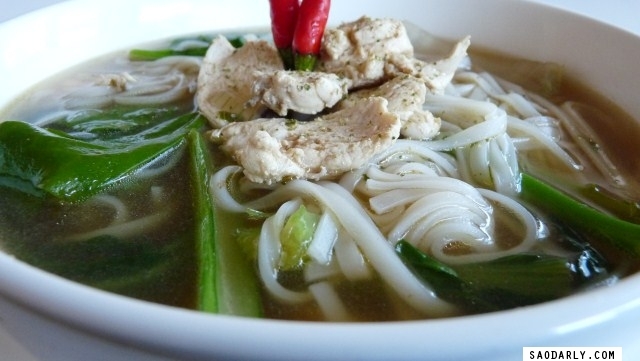 When it’s cold and wet like this, then it’s a good time for noodle soup. 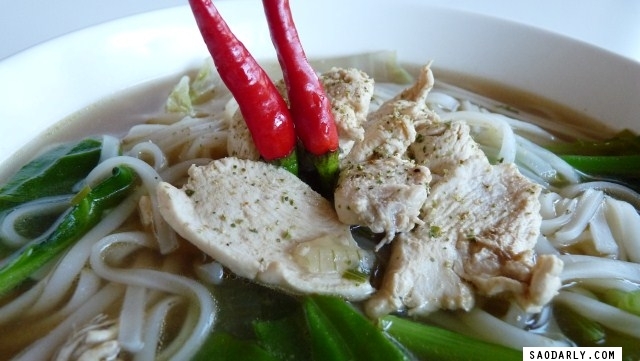 I’m not much of a red meat eater and prefer to cook chicken or tofu with rice stick noodles and add some vegetables for a good bowl of soup. Edited on July 15, 2011: Since Melanie asked for the recipe, I’ll share with you how I made the soup. Bring water to a boil, then add chicken bones, ginger, Laos galanga, coriander roots, onion and salt. Reduce the heat and let the soup stock simmer for half and hour. 1 to 2 teaspoon fish sauce, the amount depends on your own taste. Garnish: bean sprouts, sprigs of coriander, sprigs of mint, 1 chopped green onion, black pepper, 2 red chili peppers, seeded and chopped. 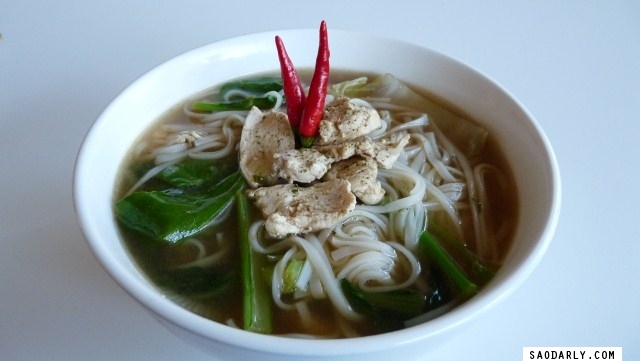 While the soup stock is cooking, soak rice stick noodles in warm water for 15 minutes, and drain. When the soup stock is ready, strain it. 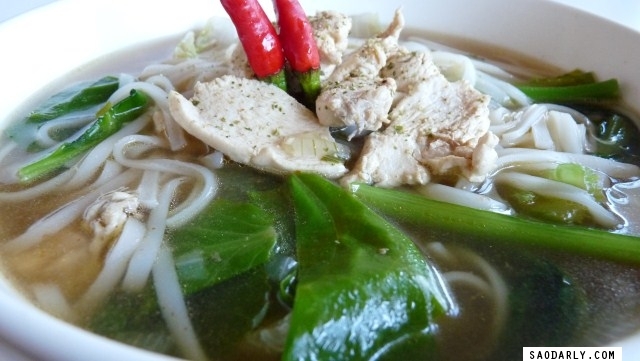 Using the same pot or new pot bring soup stock to a boil, then add chicken, rice stick noodles, and fish sauce. Reduce the heat and let simmer for 5 minutes, then add Chinese broccoli, Chinese choy sum, and napa cabbage. Let simmer for 2 more minutes, garnish, then serve the way it is or do some final touching. I like to have the extra kick in my soup, so I add more seasoning with a little bit of soy sauce, sugar, lime juice, and Sriracha sauce. I hope this helps and please excuse me if I didn’t explain properly on how to make the soup. I’m not a cook or a chef and I just throw stuff in and cooking is a trial and error method for me. Since I am allergic to MSG, I don’t add that to my cooking but most Lao people I know would add it to a soup and just about anything else. There are various ways to make make soup stock depending on the ingredients and I will post more recipes when I have a chance and tell you how my aunts in Vientiane make it. man i wnts some now, looks so delicious! @Melanie. I’m not very good at providing instructions and I don’t precisely measure things but I’ll make a post to show I made the soup.